Pipe Grabs enable quick and efficient pipe laying. They work on a scissor principle; i.e. when the pipe is lifted, the weight of the pipe causes the grabber arms to lock automatically. Opening and closing movements are controlled by a switching system. 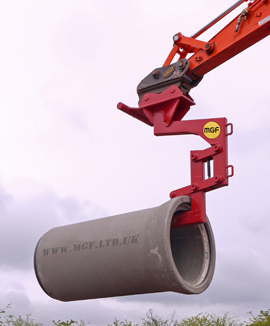 The Pipe Grab has to be adjusted to the required external pipe diameter before lifting. Depending on the external pipe diameter, different Grab arms are available. The Pipe Grab should be positioned in the middle of the pipe for lifting. Once lifted, a safety lock automatically engages and can only be released manually, thus preventing an uncontrolled early opening of the Pipe Grab during operation. Their intended use is for concrete pipes only. 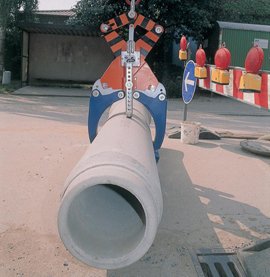 The bigger type has a lifting capacity of 5.0 tons and can be used for pipes with an external diameter of 700 – 1800 mm. The Pipe Lifter is a high capacity excavator quick hitch attachment for safe and rapid handling when laying concrete pipes. Suitable for concrete pipes from 300mm to 1200mm nominal diameter. 30º tilt for guiding pipes into position. Avoids need to access wagon bed during unloading. Avoids need for ground workers in the trench during pipe installation.